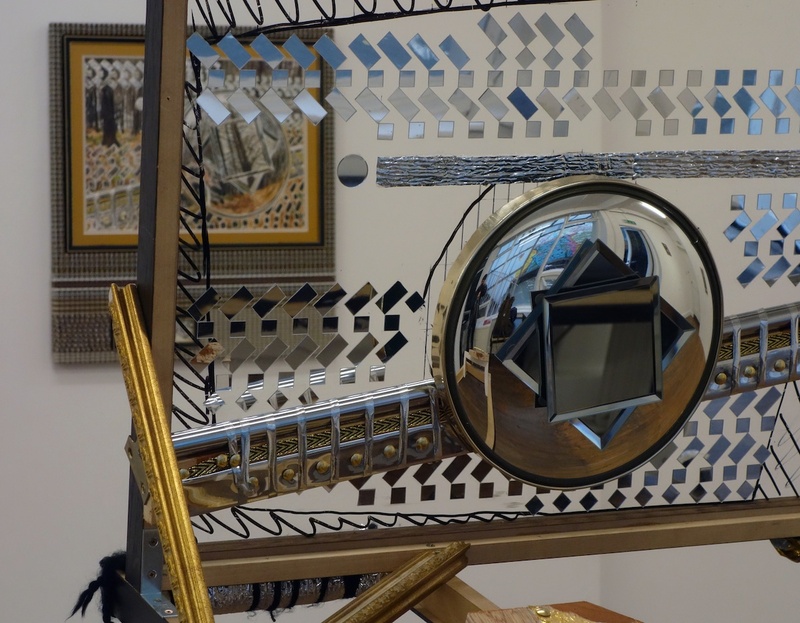 David Lunney, Chrome Dreams, 2018, Framing, ArtGlass, various mirrors (novelty convex mirror, vanity mirrors, self-adhesive acrylic mirrors), chrome pole, reflective ribbon, camera bolt, fixings, wood, 52cm x 55cm x 69cm, Photo courtesy the artist. 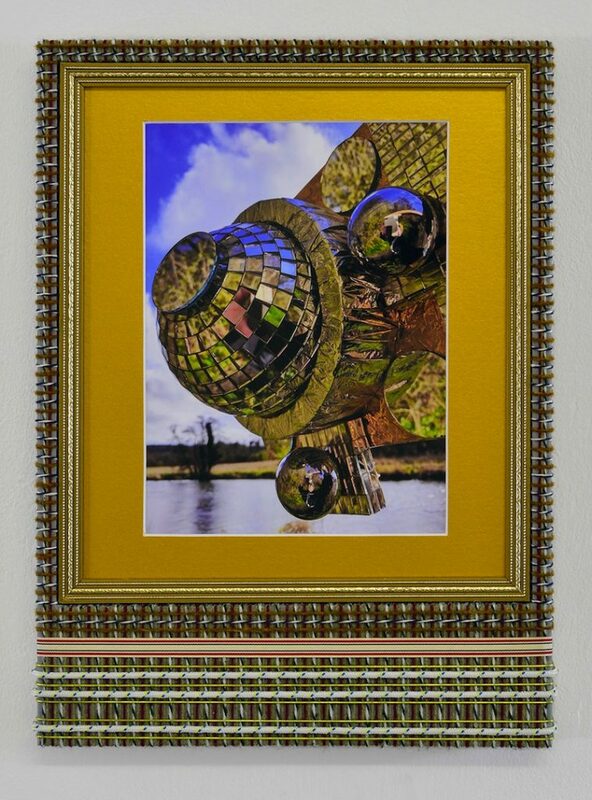 David Lunney, Chrome Dreams, 2018, Framing, ArtGlass, various mirrors (novelty convex mirror, vanity mirrors, self-adhesive acrylic mirrors), chrome pole, reflective ribbon, camera bolt, fixings, wood, 52cm x 55cm x 69cm, Photo courtesy the writer. 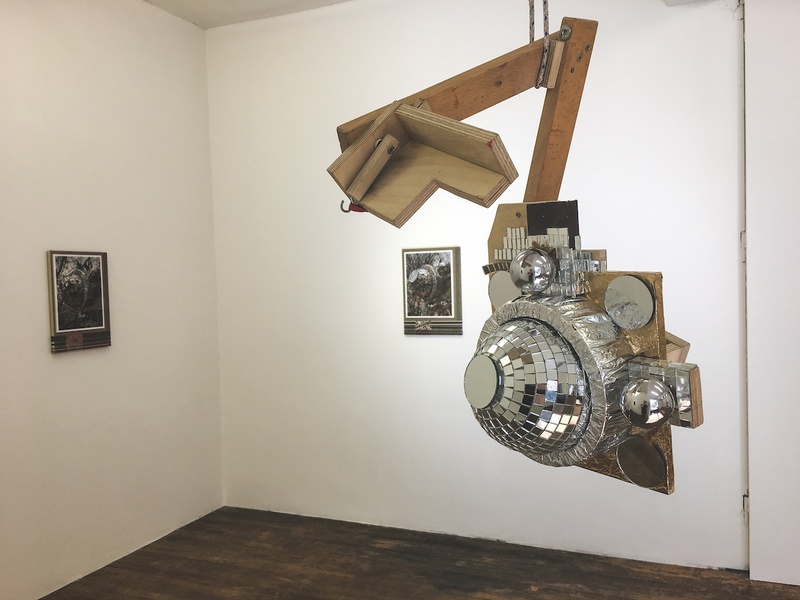 David Lunney, S.N.F., 2017, Various mirrors (baubles, disco-ball, vanity mirrors etc), foil, wood, fixings, 54cm x 36 cm x 26cm, Photo courtesy the writer. 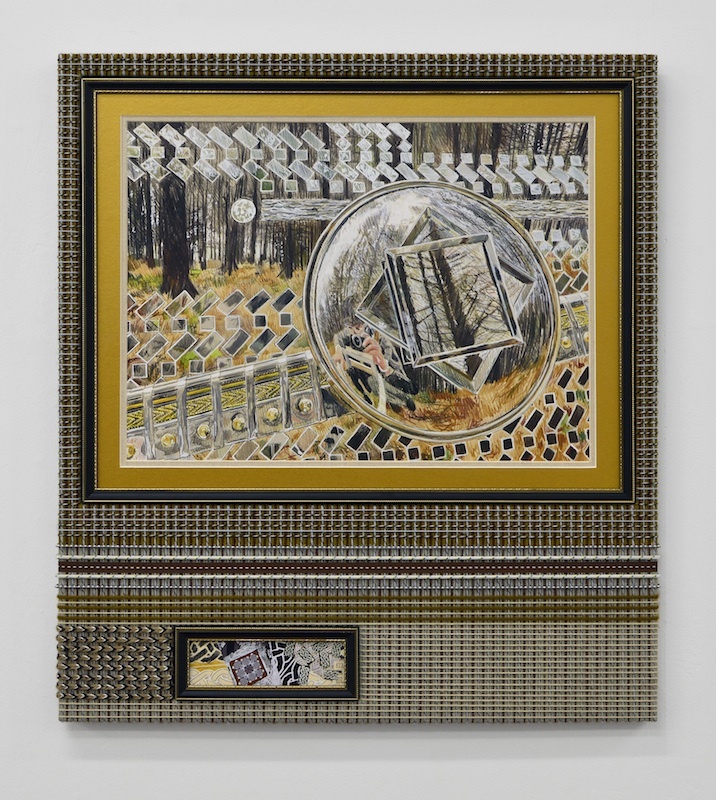 David Lunney, Things twice at Drumnadober (front), 2017, colouring pencil on paper, framing, wood, various strings and cords, ribbon, acrylic, glue, 57cm x 65cm, Photo courtesy the artist. 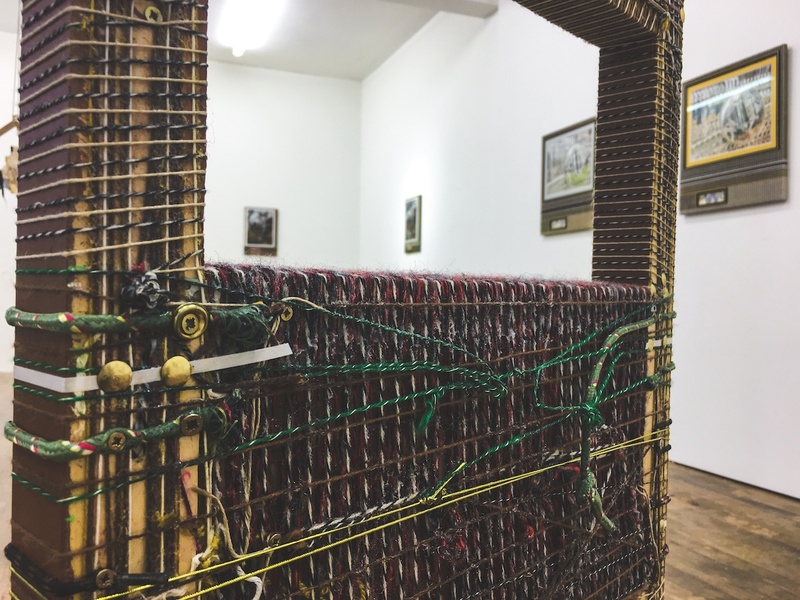 David Lunney, Things twice at Drumnadober (back), 2017, colouring pencil on paper, framing, wood, various strings and cords, ribbon, acrylic, glue, 57cm x 65cm, Photo courtesy the writer. 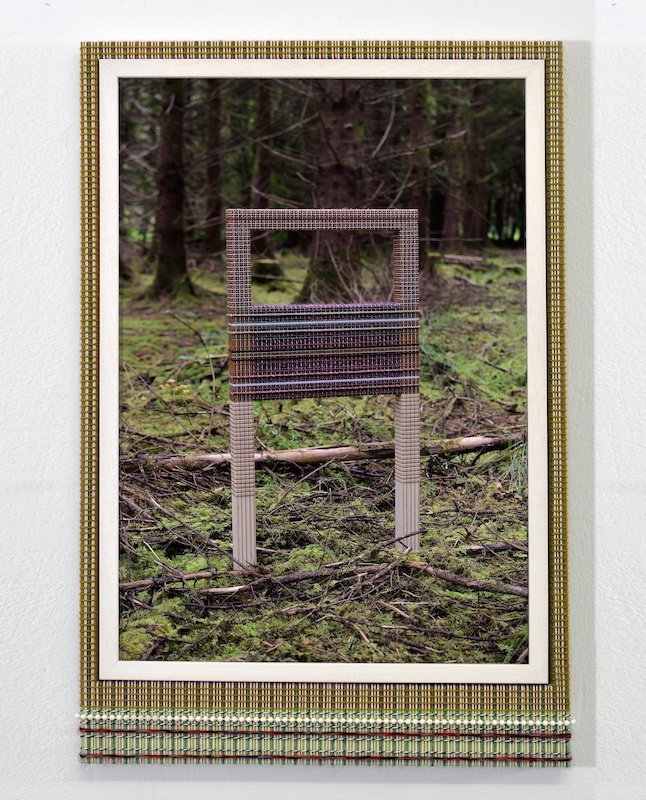 David Lunney, Chrome Dreams at Ballyedmonduff (gold), 2018, colouring pencil on paper, framing, wood, various strings and cords, ribbon, acrylic, glue, 57cm x 65cm, Photo courtesy the artist. David Lunney, S.N.F. at Battle of the Boyne Site; Byzantine Edition, 2017, colouring pencil on board, wood, various strings and cords, ribbon, acrylic, glue, 38cm x 54cm, Photo courtesy the artist. For these works Lunney employs both photography and painting, ten pieces in total: four paintings and a photograph from S.N.F., three photographic works, with one being a collage of the other two from Things Twice, and two paintings from the eponymous Chrome Dreams. In the exhibition Lunney also makes extensive use of the frame to tie or contrast elements from each of the three series together. Returning to the apparatuses for this show Lunney continues the same process for the devices which he uses to photograph the landscape, using them to create prisms of the landscapes he traverses. His method for these works consists in placing one of his device into a landscape to photograph it before removing it – making them temporary site specific. This development is a departure from his previous projects where works would be left on site for extended periods of time, often succumbing to environment or vandalism. This shift in artistic process allows him to present the devices as part of the show, enhancing their sculptural qualities (S.N.F. & Chrome Dreams) via their placement within the gallery beside their more traditional sculptural sibling (Things Twice). This alteration in turn impacts the paintings, as their rendering is no longer detached from the sculptures, which in previous iterations had become part of the landscape, but a component of them. They both facilitate each other, carrying equal weight within the narrative constructed by Lunney. 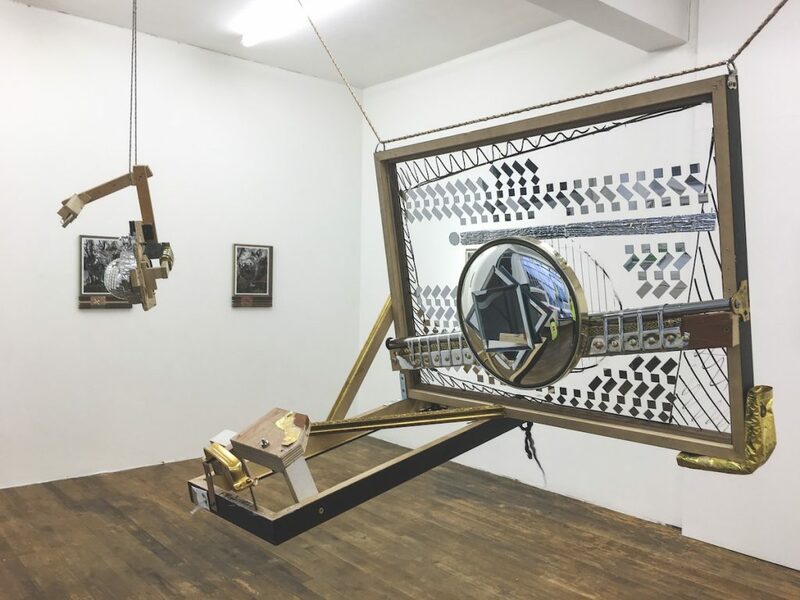 Finally, the presence of the devices allows the audience to see the relationship between the processes within his work, whilst having access to the nuances in each, highlighting the selective process Lunney went through as he created, adjusted and ultimately finalised their construction. In Things Twice his display of the sculpture used in the image creation allows the viewer to see both sides of the frame, which is created in a similar technique to the ten framed pieces on the walls. Behind the slick and organised front we see a mess of ends as the ends of ribbons, an assortment of strings and cords as well as what appears to be a blind pulley cord, are cut off and tied back. These frays draw you in and as you crouch down to inspect them, unforeseen vistas emerge which highlight snippets of the show via new framing. The pulling back of this curtain into his process reveals an artist confident and comfortable with his practice. A constant theme in Lunney’s work has been his employment of the frame as an integral part of the artwork, whose removal would alter not just the work but each component in its construction. His detailing on every frame highlights an artist who gives each stage of his artistic process the same degree of importance, with the individual factors helping make up the puzzle of the work on show, an approach that encourages the viewer to adopt deductive reasoning to view the full picture. For example, in the single photograph of S.N.F. we see Lunney’s reflection in the bottom corner, confirming his presence within the work. This figure becomes more unfamiliar and harder to define in the paintings S.N.F. generates, but together theses works confirm what we the viewer has assumed and reveal that the figure, often haunting, in the paintings is indeed the artist. This approach of utilising multiple narratives within each series ensures that the overarching story Lunney spins is carried throughout the work, but this can also lead to scenarios where the narrative feels like it was completed prior to the show, leaving the audience with the task of observation rather than engagement as tangents are sometimes curtailed. It is the duo of paintings created using Chrome Dreams that are the highlight of the show. Here the lines generated by the apparatus inject themselves across the landscape like rows of chrome trees. They fall left and right, like lines of code, and force multiple horizons across the painting. The work is framed with a double mount, which in turn is framed within another frame. Inside this outermost frame is another smaller work, framed to match its counterpart above. This smaller work is filled with symbols and patterns that evoke Celtic and Christian iconography. A nod to religion already exists in another work, S.N.F. on the Boyne (Byzantine Edition), byzantine being an adjective that became associated with both the Eastern Orthodox Church and the continuation of the Roman Empire after the fall of Rome, but byzantine feels also quite adequate to describe the intricately complex structure of Lunney’s work. The colours the artist infuses with the natural greens and browns of the landscape feel urban and alien, but innate despite their manufactured elements. The rows and rows of trees come across as constructed as his device, which in turns feels as natural as the woodland. Here the landscape becomes one he has created, captured and presented. The whimsical mythology of a Neil Young album evaporates and is replaced by emerging thoughts of suits of armour worn during the Battle of the Boyne. The illusion fades however when you turn and see the device. While seeing this aspect of Lunney’s work is fascinating, sometimes the best tricks are those that remain a mystery. Pallas through their curation program, force an immediacy and a quick gestation period for this show – both in terms of the viewer, who has a short period to view the work as there are only nine days between opening and closing, and the artist who has a turnaround period of three to six months from selection following the open call to exhibition. In the case of this work, which has been so meticulously crafted and executed, you do wonder if a longer period to discuss it in relation to the space in which it was to be shown would have accentuated some of the key elements more. That said, Lunney continues here, the development of a practice that keep evolving and re-shaping itself, and Pallas have begun this series, which includes a dozen shows through to November, quite strongly indeed. Aidan Kelly Murphy is a writer and photographer based in Dublin and is the Arts Editor for The Thin Air.